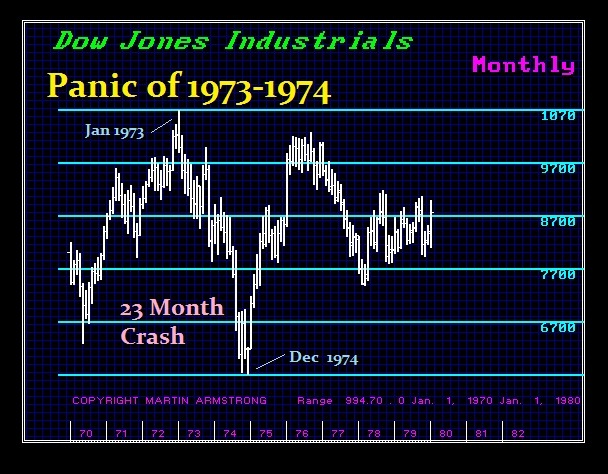 QUESTION: You compare gold and the Dow in 1980 and today. Are you saying stocks are better or are you referring to the difference in timing? 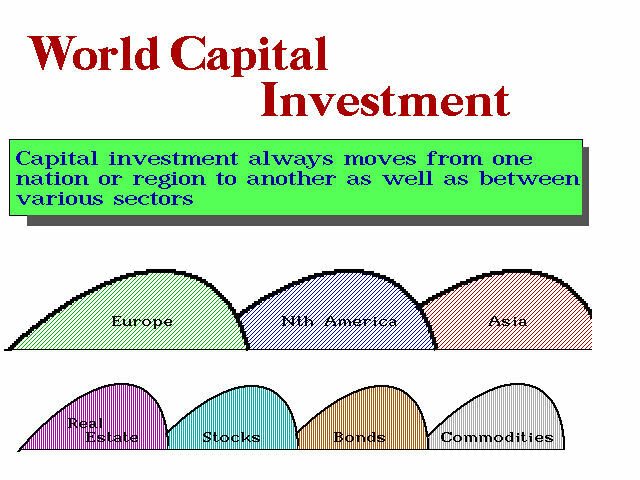 ANSWER: There are cyclical periods for each and every aspect of investment. I talk about the gold promoters because they mislead people and tell them only gold will survive. That is not true. Capital moves from sector to sector. The Panic of 1907 was focused on the Railroads. Then the Panic of 1919 was commodities, which was followed by the Industrials for the Panic of 1929. 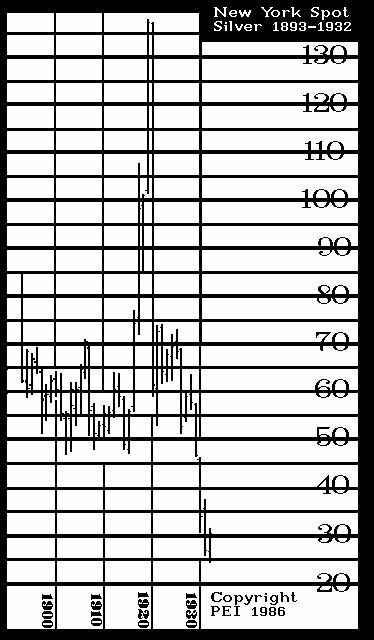 Silver peaked in 1919 and then fell into 1932 – 13 year decline. The commodities ended up bottoming with the stock market in 1932 for the Great Depression. Then the rally move into the bond market as we entered a Public Wave. 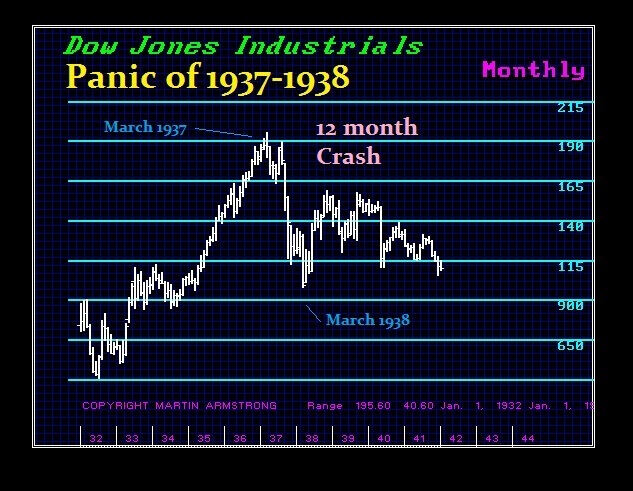 The next Crash was that of 1937, which was only 12 months, but it was scary. Most people assumed it would be a repeat of the Great Depression. 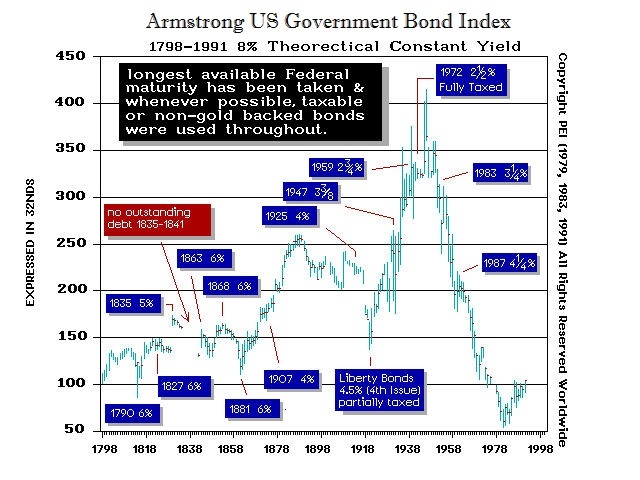 The bonds peaked in 1950 and then began a 31.4 year decline into 1981. This led to the rise in the dollar as capital was buying US debt at insane levels of interest rates. The British pound fell to $1.03 in 1985. The commodities began to rise from the 1932 low. Guess what? Adding the Pi Cycle of 31.4 years brings us to the last year silver appeared in coinage – 1964. The 1966 Crash was focused in the mutual fund sector because funds at that time were listed and people bid them up far beyond their asset worth. 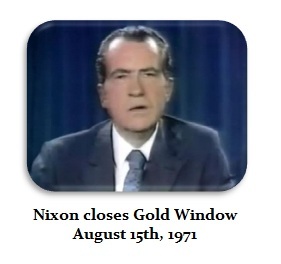 Nixon closed the Gold window giving birth to the floating exchange rate system on August 15th, 1971. That was. 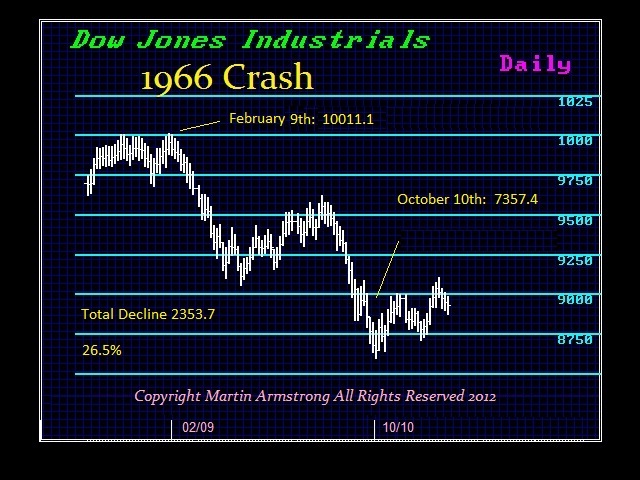 37.104 years after the dollar devaluation and confiscation of gold in 1934 (8.615 * 4.307)..
Then we have the Crash of 1974. This unfolded when foreign capital began to sell the dollar fearing it would collapse. This came 37 years after the 1937 event (8.6 * 4.3). 1980 we have the peak in commodities. 1981 we have the low in bonds peak in rates. 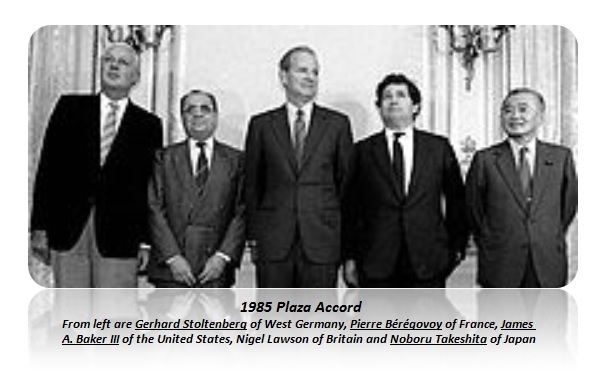 1985 we have Plaza Accord. 1987 the Crash dollar driven event that sent the dollar down 40% and capital fleeing into Japan creating the 1989 Bubble Top. As Japan peaked, capital then fled to South East Asia where it peaked in 1994 with the simultaneous low in the US Dow Jones. That lead to a tempt high July 20th 1998 in US stocks and the 1998 the peak in Russia and the collapse of Long-term Capital Management creating the first Fed bailout of a hedge fund to save the banks. Capital then flees into the US .COM stocks creating the Bubble in 2000 with the low in 2003. Then we rally into 2007 with the Mortgage Bubble and the collapse into 2008-2009. Then we have the rally to new highs in the US share market that nobody believes. The list goes on and on. The key here is that this is like lightening. It never strikes twice in the same place. Each bubble involves something different. Therefore, preaching any single investment is the alpha-omega is wrong, can cost a fortune, and in the end you may lose your shirt. One thing you can bank on – when any market reaches a bubble, move on for that is what capital will do. Never stay there expecting new highs. Sorry. It is over. You have to wait for the next cycle. So my only problem with the gold promoters is that they are no different than a bond salesman. Each have their pitch but downgrade any alternative. There is no single investment that will ever perpetually rise. Gold will rise, but only when the timing is correct. Gold rallied for 13 years. It was time for a correction. Sorry – that is the way markets trade. Live and learn – or die waiting for the next cycle.